In addition, capitalism has had an equal number of years both to develop new technologies and to bring humanity and other species to the brink of many environmental disasters including global warming, acidification and overfishing of the seas, widespread degradation of soil and water quality and the threats from nuclear waste, nuclear accidents and nuclear war. This article proposes a vision in which socially validated needs form the basis of production and in which democratic bodies resolve conflicts over whether a need is socially validated or harmful. This contrasts with ”market socialist” visions in which production continues on a commodity basis. A model based on socially-validated needs should also provide a framework for coping with the emerging environmental crisis, which requires creating social solidarity and forms of politically-coordinated decision making in a system that does not require perpetual growth. A number of authors have attempted to produce such a vision, including Alperovitz (2013), Alpert (2000), Schweickart (in Ollman 1998) and Wolff (2012). All of them suggest one or another form of worker self-directed enterprises that compete with each other, and some form of socially-directed investment, as the core for a new society. Explicit or implicit in what they propose is that production continues to be on the basis of workers of various sorts being hired to produce tangible or intangible commodities in order to sell them. These authors argue that their model is fundamentally different from commodity capitalism and its needs to destroy the environment, create social injustice and create conditions that lead to global warfare. I am not going to attempt to argue against this claim of theirs here. (But see Friedman 2008; Hudis 2012; and Ollman 1998 for further discussion.) Instead, I want to offer a different view of what kind of new world we might aim for. Let me add a disclaimer here: This paper does not attempt to resolve the question of how the working class (or “the 95%”) might oust capitalism from power. (3) This would require a book, not an article. Instead, in this paper, to provoke discussion and debate as widely as possible, I focus on what kind of society we might produce. Such discussion is needed to help the various movements of workers, communities, and others who are currently fighting the consequences of capital’s power to devise a clearer picture of what we are for. Provoking discussion of these topics now is essential as a way to help the working class and its allies to get over the idea that there is no alternative to capitalism, which may make it somewhat easier to build working class and other movements for radical social change. It is also a way to help set the stage for a political debate when and if we take power that may make it easier to figure out what to do. I posit that when and if the broadly-defined working class comes to have dominant power in a large section, or all, of the world — regardless of the means by which we get there — we will need to end commodity-based production, commodity-based exchange, commodity-based belief systems and commodity-based culture as quickly as possible. 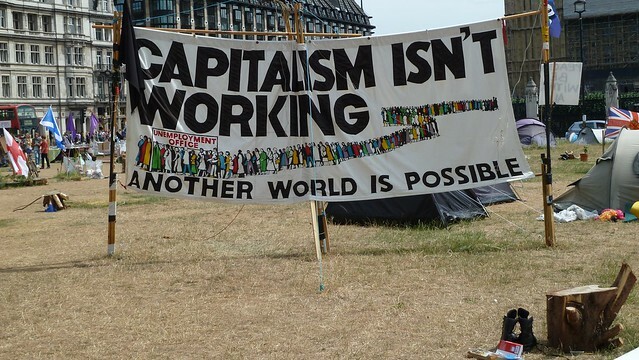 First, continuing to have a world in which production is conducted and driven on a commodity basis — which means that workers sell their labor power to producers (who then trade with each other and with “consumers” to get exchange value back with which to buy more labor power and more physical inputs) — tends to recreate capitalism either in its state capitalist form (which some called Communism) or its corporate capitalist form. We saw this tendency in Russia, where the economic backwardness and political isolation of the country, which created an inability to make a transition to non-commodity production, led to a restoration of (state) capitalism and to the exploitation of workers and the environment. Second, the environmental crisis will be severe by the time the working class manages to take control of the world. This means that a great deal of human effort will have to be spent mitigating its effects and preventing any worse ecological devastation from occurring. This cannot be done with the environment as a commodity (Ekeland, 2014; Foster, 2013; Neale, 2008); instead, it will require some form of politically-coordinated decision making in a system that does not require perpetual growth for its survival. That is, these actions will best be taken in terms of meeting socially-validated needs. What then does it mean to say that we will try to create a society in which production and distribution are based on socially-validated need? 1) No one will need to, nor be able to, sell their labor power. This is the minimum criterion for a society based on socially-validated need, since selling one’s labor power makes it (and its products) into commodities with exchange value. People will nonetheless work, not out of a need to get pay in order to live, but as part of their expected duty to others and, hopefully to an increasing extent, because we are able to re-design work so we will enjoy much of it. 2) To make it possible for people to avoid selling their labor power, we will have to find ways to make a “decency living standard” available to everybody. Marx in the Critique of the Gotha Programme, and Hudis (2012) have suggested that people will be provided with what they need to consume by giving workers an amount tied to the number of hours that they work. I suggest in my review of Hudis’s excellent book that the proposal to tie consumption to labor time is only one of several ways to regulate production among producers, motivate work and assure working people a decency living standard (Friedman 2014a), and see these possibilities as issues that we will discuss and experiment with, and struggle over after we take power. (4) Here, however, I develop ideas of socially-validated need that concretize how needs might be met that are congruent with Marx’s and Hudis’s ideas but are also compatible with approaches not based on labor time. 3) For points 1 and 2 to work out, we will need to find ways to end the widespread attacks on workers’ and others peoples’ dignity (Friedman, Rossi & Ralón, 2015) and end oppression of women, nationalities, racial/ethnic groups etc. Failure to do this — particularly in a society where expectations for change will have risen greatly due to the struggles to establish working-class supremacy — would likely lead to considerable social conflict that may disrupt the transformation as a whole. The argument so far pretty much mandates two priorities for what gets produced. First, to enable point 2, enough goods and services have to be produced and delivered so that everyone in the world can maintain a decency consumption pattern. Second, in order to maintain a decency living standard over time, we will need to prioritize solving the environmental crises and making production and distribution take place in sustainable ways. It is hard to say much more about what the working class in power will choose to produce. A world of democratic freedom means decisions that may be hard to predict. Nonetheless, it seems useful to go beyond what we can be sure of, and to discuss what is likely to happen. As described below, once we have gotten away from the capitalism-driven need to produce and consume in order to make profits, and can instead start to discuss and decide how to spend our time and our efforts, we will be able to re-shape our desires and culture in profound ways. An enormous amount of our lives under capitalism is shaped by the need to save time so we can use it on long commutes to work, on long hours working, and on shopping for clothes and other things we need to get and hold a job. Instead, I predict that we will want to value friendships wherever we work, and in our communities, and having time to think and contemplate our lives. Beyond that, if wars are largely based on capitalism and its needs, as the anti-war movement and most Marxists believe, then we no will longer need to engage in the vast amount of human labor and worry spent on war and preparation for war, and this can give more of us time to enjoy ourselves. All of this is somewhat speculative, but it adds up to something profound: If we can reorganize our lives around producing for socially-validated use rather than producing commodities to exchange, we can get away from a culture of competition and compulsive consumption and start to build a society and culture where we can care for each other and enjoy time talking and playing together. Many readers might agree that these ideas seem appealing, but fear that they might devolve into despotism, as the Soviet Union did, or simply collapse. I want to suggest a few ways in which to establish a society based around meeting socially-validated needs in a form that we could maintain. We will need to establish higher-level democratic councils as well, and probably go through many disputes over what layer of councils will have the final say over what kinds of decisions. The form of democratic selection and control over higher-level councils is something we will argue over for many years. Local councils are likely to involve direct democracy to a large degree, although this may be supplemented by a degree of representative democracy. I see these arguments and struggles themselves as part of a process that will help prevent bureaucratization or a new ruling class from developing (as they did after the Russian Revolution, which was initially based in workers’, peasants’ and soldiers’ councils). (5) C.L.R. James (1960) has suggested random selection of any representatives we need by lot; Farber (1990), Cliff et al. (1970) and many others have suggested program-based electoral campaigns and (as Marx  argued in his writings on the Paris Commune) easy ways for the electorate to remove council members at any time. Some readers might object that such councils take time that needs to be used in production lest the company lose out to its competition, or that nobody would come to the meetings because they were too busy. The first objection assumes the continued existing of competition among companies or other productive units. Basing decisions on socially-validated need rather than on producing for sale gets away from this necessity. (See below for a proposal to handle distribution in ways that escape this issue.) Furthermore, I am not too concerned that this will “lead to slower growth” or similar worries that are based in capitalism’s need for continual growth. If we are able to find ways to control how we use our time and what we produce reasonably democratically, we can avoid the enormous waste production that Baran & Sweezy (1966) pointed to decades ago and this will compensate for any time lost in meetings. On the other hand, we will need to be efficient in meeting various emergencies including those produced by global warming. Meetings of the kind I am discussing will be able to resolve many of these issues locally. The second problem, of participation in meetings, is a serious one. For neighborhood and workplace councils to work out, I think that we will need to establish the political and cultural point that time taking part in such activities is important, and should be considered as part of the work time that everyone will expect pretty much everyone to do. Obviously, making all of this possible and enjoyable will be something that a liberated society will have to experiment with — as will the mechanisms to discuss the popular norms for how much time people should expect to spend working. How to avoid production for sale? Here I make a moderately concrete proposal for how we might organize production and distribution in a bottom-up way that avoids markets and the re-constitution of the value-production-based alienated society that markets may help to re-produce — at least unless we have eliminated all vestiges of the selling of labor power including systems of workplace cooperatives in which income or working conditions depend on selling the products. To be clear, the process I will describe here is not “exchange,” but rather distribution, because those getting the products do not pay, trade or in other ways reimburse those distributing them. In short, we need to build in an expectation that if someone needs something, and we can provide it, we will — unless we think that this will create undue hardship for the producers (us) or for others who might have to wait for the product, or if we think the product or need is in itself harmful to fulfill. In such instances of disagreement, the requestor should be able to refer the issue to the council system for a democratically-based decision. As discussed below, during the period when we set this system up, and perhaps beyond that, we may want to reinforce (or prevent the need for) council decisions by developing gentle ways to exert both community and perhaps organizational social pressure on those who do not meet others’ needs. On the other hand, should those who are being asked to work for the benefit of another person or organization disagree with the decision of the higher council, I would hope that there would be agreement that these workers would have the right to strike against it. The need for personal interaction will remain to some extent, but will now be done in terms of socially-validated need being met and a democratic decision-making process at each workplace about what needs can and cannot be met — together with mechanisms for more thorough discussion, perhaps in broader councils, when difficulties arise. I see these interactions as profoundly valuable, since they will form part of a social process by which working people the world over can interact and can develop shared understandings and norms — which will be an important part of de-commodifying and reshaping our culture. To make such interaction easy will probably require prioritizing production of web-based information systems (like Skype) whereby needs and difficulties can be communicated and discussed and whereby people and groups who can meet the needs can offer to do so. We will probably want this system to encourage direct worker-to-worker communication and friendships that produce solidarities to smooth over any difficulties. If possible within environmental restraints (such as minimizing jet travel with its effects on the atmosphere), face to face visits will make this work even better. Once up and running, this system of meeting socially-validated need should be able to provide everyone with the decent living standard described above. Nonetheless, at least in the beginning, there are likely to be difficult political decisions, not least around how to move to a world of equality while still dealing with the disasters global climate change will create. At the global level, capitalism has provided far more goods and services to most people in “developed” countries like Germany, the United States or Japan than to most people in Bangladesh or Uganda. This has resulted in uneven levels of “need” between people in these countries, and thus poses problems about how to bring about human equality. Those who live in upper-working-class housing in developed countries will expect to have their need to maintain that housing validated and met, even though this is likely to require more resources than maintaining workers’ housing in the global South, which will probably be one dimension of social discussion and conflict in this period. All this, unfortunately, will be complicated by the strong likelihood that the working class will come to rule society only at a time when the rigors and migrations based on global climate change are creating many new needs and problems. Culture involves many forms of values, norms, beliefs and expectations. For a system like that described in this article to work requires developing a culture that supports its fundamental assumption — that we should help each other if we can. We will want this to seem “natural,” as well as good. To the extent that this takes place, for example, the system of expectations about providing goods or services for those who request it may well extend to normative systems that gently apply pressure to individuals both to make reasonable requests and to meet such requests unless there is a good reason not to do so. One important cultural change is likely to involve the kinds of work people are expected to do. At first, I would expect, most people will have one workplace where they will also have (as “work time”) time to socialize and to attend various meetings — which, as was discussed above, will also make workplace councils with wide participation possible. Over time, I think we will want to create a norm of two workplaces (or roles at one workplace) per person, with one involving more physical or dirty activity and the other one more social or mental activity. We are also likely to want to (and perhaps have to) develop limits on how many hours of work any group could request and expect any one person to do. (Until and unless we solve the problem of commuting, we might want to add commute time in as part of that total.) Here, it will be important to let people volunteer more time — which will be critical for emergency situations (e.g. hurricane disaster work) and for some kinds of research and teaching, as well as something some people might freely choose to do if they especially enjoy their work. These changes also imply the end of capitalist needs for division, competition and scapegoating, and thus open up possibilities to remove many of the inequities and insults that make life difficult now. Sexual hierarchies and racial/ethnic hierarchies that have been based in part on competition for jobs and educational opportunities, and on a culture of having to compensate for the constant dignity-denials that permeate capitalism (Friedman, Rossi & Ralón 2015), will now become much more vulnerable to attack and change. These oppressive structures are not going to disappear automatically — but we will be able to discuss them much more openly and without having to confront the needs and fears of capital and its states every step of the way. On a related point, once capital is done away with we will be able to reduce or eliminate the constant insults to our dignity just referred to. Another way to think about how our culture may change is to think about how people may change the way we “spend” our time. Here, the sociability built around planning production and distribution, and planning the re-organization of neighborhoods to encourage fun and sociability rather than access to shopping — all of which are implicit or explicit in what I have written above — are only the bare outlines of a beginning. To the extent we can reorganize life so we can live near where we engage in production activities of various sorts, we can cut down on commutes, and on the related need for personal automobiles. We also should be able to find ways to create localities where we can hang out and enjoy ourselves — and get to know others more than we can now. Here, I have in mind that malls are much less enjoyable places to hang out in than parks, pubs or probably the agoras of old. With more opportunity to sit and think, and then to talk over our ideas with others in non-threatening contexts, I suspect that this time and the new social relations will democratize the arts and sports so they become group activities and enjoyment rather than mass media spectacles. But I may be verging on utopianism: Global climate change may be so severe by the time we get rid of capital and capitalism that more of our time will be spent on cleaning up the mess, and less on building sociability, than any of us would wish. None of this will be easy — particularly building a new world on the ashes, excretions and global warming of the old, and on the national inequalities and racist and other histories of oppression that have helped to disunite workers for centuries. But I think that the idea of a “society based on socially-validated need” provides a concrete universal(8) that points a useful general direction to motivate and help steer our struggles and our hopes. My conception of “working class” is quite broad but also varies depending on what we are trying to use the concept to describe. I have given a fairly full discussion of what I mean by “worker” in terms of breadth — which in the USA would include much of the “95%”— in Friedman (2008), and updated this (Friedman, 2013) in terms of how “working class” should have different meanings in terms of thinking about the generation of surplus value in capitalist economics versus the practical work of organizing unions or workers’ parties to deal with the problems of a capitalist society versus the composition and activities of workers’ councils during and after revolutionary struggles. This could come about through various scenarios. All of them, in my opinion, will involve considerable social conflict, mass demonstrations, and mass strikes, and almost certainly mass defection of military personnel to the side of the mass movement for change. Hopefully, this process will involve relatively little violence, as was the case for Tunisia and Egypt in 2011 and 1917 in St. Petersburg — though this requires soldiers’ refusals to attack the movement. These issues have been discussed by Cliff et al (1971), Draper (1961, 1981), Dunayevskaya (1958, 1973, 1981, 2002, Farber 1990, Friedman (2008, 2010), James (1960, 1980), Trotsky (1957). And here let me insert a final footnote on this issue: I by no means equate the working class with the labor movement. Most workers are not part of the labor movement, particularly if that is seen as consisting primarily of union members who take part in union activities. The forms of struggle that workers use to defend or transform their lives vary widely — and to take up this question here is to write a book, not an article. It should be noted that to the extent we succeed in ending commodity production (and thus the selling of labor power for a “living”) and exchange, we will also end capitalist production and the working class will cease to exist as a working class. This process is likely to proceed unevenly and to take some (hopefully few) years. Similarly, the democratic political rule of the working class will change as capitalism ends and we transform into the democratic self-rule of humanity. I have tried to describe these changes in Friedman (2008), but by and large we will come to understand these processes only as we struggle through them. On the process by which they were bureaucratized and destroyed, see Farber, 1990, and the works in the references by Cliff et al., Draper, Dunayevskaya, and James. Note that this is not the same as Marx’s phrase “from each according to their ability, to each according to their need,” which can only come about later in the process of transforming the world. I am suggesting that this mode of distribution in accord with socially-validated and feasible need might begin to be implemented as soon as the working class assumes the direction of production and distribution. In the Khrushchev and Brezhnev eras in the USSR, interpersonal contacts among enterprise representatives occurred to negotiate trading of favors and goods (Dzarasov, 2014). These bureaucratic transactions differed fundamentally from what I am discussing here because they were not transacted as expressions of the power and will of the workers at these enterprises and, most especially, because they were not in terms of meeting democratically-validated demand for use values. As such, they also did not serve to build cross-enterprise worker solidarity, friendship and power. Anderson, 2013; Gogol, 2012, particularly ch. 14; Friedman 2014b. Albert, Michael. Moving Forward: Program for a Participatory Economy. San Francisco: AK Press, 2000. Alperovitz, Gar. (2013) What then must we do: Straight talk about the next American revolution. White River Junction, VT: Chelsea Green Publishing. Anderson, Kevin. (2013) “Resistance versus Emancipation: Foucault, Marcuse, Marx, and the Present Moment.” Logos: A Journal of Modern Society & Culture 12:1 (Winter). Baran, Paul A. and Paul M. Sweezy. (1966) Monopoly Capital. New York: Monthly Review Press. Cliff, Tony; Duncan Hallas; Chris Harman; Leon Trotsky. (1971) Party and Class. London: Pluto Press. Draper, Hal. The Two Souls of Socialism. Berkeley: Independent Socialist Press, 1961. Draper, Hal. (1981). Karl Marx’s Theory of Revolution: The Politics of Social Classes. New York: Monthly Review Press. Dunayevskaya, Raya. Marxism and Freedom. New York: Bookman, 1958. Dunayevskaya, Raya. Philosophy and Revolution. New York: Dell, 1973. Dunayevskaya, Raya. Rosa Luxemburg, Women’s Liberation, and Marx’s Philosophy of Revolution. 1981. Atlantic Highlands, New Jersey: Humanities Press. Dunayevskaya, Raya. The Power of Negativity. New York: Lexington, 2002. Dzarasov, Ruslan. (2014) The Conundrum of Russian Capitalism. London: Pluto Press. Ekeland, Anders. “A Fossil Fuel Exit Program.” Against the Current, May/June 2014. http://www.solidarity-us.org/site/node/4155. Farber, Samuel. (1990) Before Stalinism. The Rise and Fall of Soviet Democracy. New York: Verso. Foster, John Bellamy. “James Hansen and the Climate-Change Exit Strategy,” Monthly Review, February 2013, http://monthlyreview.org/2013/02/01/james-hansen-and-the-climate-change-exit-strategy. Friedman, Samuel R. “Sociopolitical and philosophical questions of organization in making a human society.” Interface: a journal for and about social movements Essay. Volume 2 (1): 144-153 (May 2010). http://www.interfacejournal.net/ or http://interface-articles.googlegroups.com/. Friedman, Sam. “What is the ‘working class’?” (2013) Against the Current, 163 (March/April), 36, 40. http://www.solidarity-us.org/node/3813. Friedman SR (2014a) “Yes, There is an Alternative! : A review of Peter Hudis, Marx’s Concept of the Alternative to Capitalism.” Against the Current 169 (March/April). http://www.solidarity-us.org/node/4111. Friedman, Samuel R. (2014b) “Hegel’s Absolutes and Revolution: An expanded Review of: Eugene Gogol’s Toward a Dialectic of Philosophy and Organization.” Critical Sociology. DOI: 10.1177/0896920513518949 published online 2 May 2014. http://crs.sagepub.com/content/early/2014/04/29/0896920513518949. Friedman, Sam; Rossi, Diana; Ralón, Gonzalo. (2015) “Dignity Denial and Social Conflicts,” Rethinking Marxism: A Journal of Economics, Culture & Society, 27:1, 65-84, DOI: 10.1080/08935696.2014.980675. Friedman, Sam. (2015) “What happened in Ukraine?” Z-Net. July 6, 2015. https://zcomm.org/znetarticle/what-happened-in-ukraine/. Reprinted in New Politics; and (with footnotes) at International Marxist Humanist Organization http://www.internationalmarxisthumanist.org/wp-content/uploads/imho-article-friedman-20150718.pdf & at Ukraine Solidarity Campaign http://ukrainesolidarity campaign.org/2015/08/03/maidan-and-after. Gogol E (2012) Toward a Dialectic of Philosophy and Organization. Boston, MA: Brill. Hudis, Peter Marx’s Concept of the Alternative to Capitalism. Brill, 2012: Historical Materialism Book Series. James, CLR 1960. Modern Politics. Trinidad: P.N.M. Publishing Co.
James, CLR. Notes on Dialectics. Westport, CT: Lawrence Hill, 1980. Marx, Karl (1938) Critique of the Gotha Programme. New York, NY: International Publishers. Marx, Karl. 1966. The Civil War in France. Peking: Foreign Languages Press. Marx, Karl. 1967. Capital, Vol. 1. New York: International Publishers. Neale, Jonathan. 2008. Stop Global Warming, Change The World. London, UK: Bookmarks. Ollman, Bertell. (1998) Market Socialism: The Debate among Socialists. New York: Routledge. Trotsky, Leon. (1957) The History of the Russian Revolution. Ann Arbor: The University of Michigan Press. Wolff, Richard. (2012) Democracy at Work: A Cure for Capitalism. Chicago: Haymarket Books. This entry was posted in All Posts News Politics and-or Videos, Anti-war, Capitalism, Culture, Economy, Environment, Global Warming, Labor, Politics, Socialism and tagged Climate Crisis, Sam Friedman, Very Important or Must-Read Posts. Bookmark the permalink. ← Julian Assange: It’s Not An Intelligence Report (Full Press Conference and Q&A) + Abby Martin on ODNI Report: It’s Insane! I want to start by thanking you all for discussing the paper I wrote. This is why I write such papers–to provoke discussion of ideas around what we are trying to create. I was somewhat confused by the comment that I was creating a bureaucratic system. This is not at all what I think I am describing. What I would like to some come into creation is a system where people decide from below what should get done to the greatest extent possible. I think the processes I describe under the part on socially-validated need fit this model. They provide a degree of review–for example, if some group wants to build a pipeline for fracked gas, then it does need review. And I think a council system of the kind I describe will be needed also to help us figure out how to deal with the climate and other mess capitalism will stick us with. I liked the discussions of feedback loops etc. I also have considerable background in these areas, and it is quite clear they may run amok. On the other hand, the extent to which they will do so on climate change, e.g., is still unclear (though the preliminary analyses are mostly pretty grim.) But that just means we have to think through how to respond. I am unconvinced by Rocket Kirchner’s argument that just giving it away will work on a large scale in the current system. It might work with his music, but it sure wouldn’t work with mine (which is more of a nuisance than an art). And I do not see people sending in tips to rice farmers on any scale, or people who do roadbed work on the railroads. I know I have not covered all the issues raised. I have a very demanding day job doing AIDS research so time to do so is an issue. But in any case, thanks for discussing this! How do we melt the icy heart without using the blow torch and change man without jackhammers applied to the Foundation? Religious man failed. Feudal man failed. Bourgeoise man failed. Soviet man failed. Maoist man failed. Castro, Ortega, and Chavez failed. We cannot envisage such a change of life overnight, in ten years and I submit in 100. If man were angelic there would be no government required to coerce 6 billion to do something they do not want to do. As a science fiction reader and writer I can summon implausible incredible futures as can any man, but do they come when you do call? Some further thoughts. I think Friedman is asking what bureaucratic system people can believe in during the transitional period, while we are replacing capitalism with something else. What can the “something else” be? And in how much detail should it be specified or explained to them, to get them to convert and join us? I am inclined to go with as little detail as possible. I think that we need a transition to an entirely different attitude about society, and for that we need inspiration, not a blueprint for bureaucracy. So I guess I’m mostly agreeing with Rocket’s comment above. You may say I’m a dreamer, and I don’t know how the details of my dream would be worked out, but I don’t need to know the details — I believe in the dream. I guess I have faith that it would be worked out somehow. Look inside yourself, at the best parts, the parts that care about your loved ones, and remember that we’re all the same flesh and blood with the same things inside, and you’ll find all the proof you need. Admittedly, it may be easier in some lines of work than others to visualize simply giving away one’s gift. I was a professor of advanced mathematics at a major university (recently retired). At the beginning* I loved the work I was doing — I loved the beauty of math and I wanted to share it with students — but it’s hard for me to imagine how I could have quit my job and given up my title, and simply begun lecturing for free with a tip jar beside me. The students were paying not only for my knowledge, but also for the credentials that the system could supply to them, that they couldn’t get from a tip jar. Marx, Kurzweil, and McPherson all predicted futures. I think we’re now seeing a close race between Kurzweil’s and McPherson’s predictions, with Marx’s prediction (including Friedman’s ideas) running a distant third. Marx’s predictions are based on what the world has been like physically for the last 10,000 years. And certainly, if the world continued like that, then I’d prefer Marx’s plan, and Friedman is discussing his ideas of how best to implement Marx’s plan. Guy McPherson says we’re headed toward ecosystem collapse, and we’re all going to die. I think he may be right about that. I’d prefer that we avoid that fate, and so the question is, how do we avoid that fate? Friedman mentions that question, though only very briefly. He says, and I agree, that we need to end capitalism if we are to have any hope of saving the ecosystem. But I’m not convinced that we need to figure out postcapitalism in so much long-term detail as Friedman is doing, for reasons I’ll explain in a moment. I think all we need is to get most people to agree that capitalism is wrong, and that we need to work together in a non-capitalistic way to stave off ecosystem collapse. And we need to do it quickly, because global warming is accelerating faster than most people realize. Feedback loops cause exponential growth. And a lot of people seem to think “exponential,” when translated from mathematics to plain English, just means “big,” but that’s not what it means. A better translation would be “growing, and then growing faster, and then growing faster still, and then growing much much much faster.” I think that all these newspaper articles about floods in the year 2100 are written by people who don’t understand exponential growth. I think the year to ask about is 2025, or at most 2030. And if we get past that bottleneck, I wouldn’t worry too much about the long-term version of postcapitalism. Ray Kurzweil pointed out that the improvement of computers and information and robots is also a feedback loop and exponential growth. And so, if ecosystem collapse doesn’t kill us soon, the growth of information will give us sustainability, and the improvement of robots will give us labor-free lives. We may still be facing some problems about how to live our lives, but those problems will be of an entirely different sort than anything Friedman is mentioning. On the other hand, it may be hard to convince most of society of any of what I’ve just said. I taught calculus for 30 years, so I know feedback loops and exponential growth really well, but most people don’t. Maybe they will believe Friedman’s predictions more readily than they will believe mine, and they may need that belief to join in the fight against ecosystem collapse. Thanks for your commentary, Lefty, I was hoping that you’d read this and comment. One can do an end run around supply and demand or exchange and distribution by simply giving away what one creates. This makes both Capitalism and Marxism mute. Why ? because – and this is where Anarchist Kroptkin comes in – mutual aid and relentless volunteerism can revitalize community without the crutch of any economic model . a good example is how i make a living. i have never sold one record that i have made of my music. and yet since 1983 when i started my record company it works . how can this be ? confidence in what you create. i give them away at my shows . people can decide if they want to take one for free or throw money in the tip jar. when one chooses to not use the corporate model it really creates an atmosphere of liberty and change around one . and in community . but some people just cant believe it and i find that it is a threat to other artists . but they cant move product and endup in jobs they hate. i suggest that they just give it away and they will get a following . very few do it . But how many of those years of working as a full-time musician were you living in poverty? College graduates don’t have that choice as they have huge student loans to pay off.